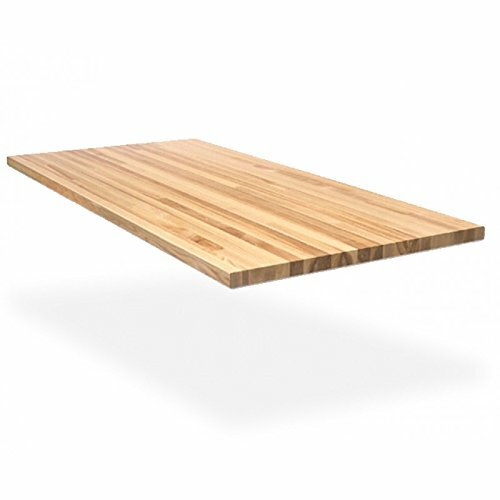 Maple Table Tops 1-3/4" thick are the most traditional of all Butcher Block products. Its soft graining and subtle color variations complement any kitchen. These table tops look fabulous finished in the standard Durakryl 102 finish which is NSF Certified for Food Safe contact. Solid Northern Hardened Maple Butcher Block tops are as beautiful as they are functional. 1-3/4" Thick Maple Tops come with a 3/16" radius edge which is easy on the forearms while sitting at the table. 60" x 30" x 1-3/4". It is not necessary to sand off this finish prior to using the top, as it is approved for food service use. The finish is formulated to repel most household solvents. Stains can be cleaned off with finger nail polish remover or bleach, neither of these two substances can hurt the finish. Although the finish is durable, it will scratch and using the surface as a cutting board will degrade the finish. The wonderful feature of butcher block is that a light sanding of the effected area and an application of "Good Stuff" brings the block back to is original condition. Because the block is solid through and through you can rest assured that the nicks, dings and dents that life puts into the block can be repaired with simple techniques. This assures you that the appearance of your counter-top can be maintained for years to come. If you have any questions about this product by Wood Welded, contact us by completing and submitting the form below. If you are looking for a specif part number, please include it with your message. Fab Glass and Mirror 1/4" Thick Flat Polished Round Tempered Glass Table Top, 47"